Close up of an MBE from 1945 showing the "For God and the Empire"
The Most Excellent Order of the British Empire (often shortened informally to "Order of the British Empire") is the "order of chivalry of British democracy", rewarding service in a wide range of useful activities. It was established on 4 June 1917 by King George V, and comprises five classes, in civil and military divisions, the most senior two of which make the recipient either a knight if male, or dame if female. There is also the related British Empire Medal, whose recipients are affiliated with, but not members of, the order. The senior two ranks of Knight or Dame Grand Cross and Knight or Dame Commander entitle their members to use the title of "Sir" for men and "Dame" for women before their forename. Most members are citizens of the United Kingdom or the Commonwealth realms that use the Imperial system of honours and awards. Honorary knighthoods are appointments of citizens of nations of which Queen Elizabeth II is not Head of State and may permit use of post-nominal letters but not the title of Sir or Dame. Occasionally, honorary appointees are incorrectly referred to as Sir or Dame. The American Bill Gates was appointed a Knight Commander of the Order and is entitled to use the post-nominal letters KBE but is not addressed as Sir Bill or Sir Bill Gates. Bob Geldof is an Irish citizen and as an honorary appointee is entitled to use the post-nominal letters but not the title of Sir. Honorary appointees who later become a citizen of a Commonwealth realm can convert their appointment from honorary to substantive, then enjoy all privileges of membership of the order including use of the title of Sir and Dame for the senior two ranks of the Order. An example is Irish broadcaster Terry Wogan, who was appointed an honorary Knight Commander of the Order in 2005 and on successful application for dual British and Irish citizenship was made a substantive member and is now styled as Sir Terry Wogan KBE. The Royal Victorian Order honoured those who had personally served the Royal Family. In particular, King George V wished to honour the many thousands of people who had served in numerous non-combatant capacities during the First World War. Originally, the Order included only one division; however, in 1918, soon after its foundation, it was formally divided into Military and Civil Divisions. The Order's motto is For God and the Empire. At the foundation of the Order, the "Medal of the Order of the British Empire" was instituted, to serve as a lower award granting recipients affiliation but not membership. In 1922, it was renamed the "British Empire Medal". The British Empire Medal stopped being recommended by the United Kingdom as part of the 1993 reforms to the honours system, but was revived in 2012, starting with 293 BEMs awarded for the Queen's Diamond Jubilee. In addition, the BEM is used by the Cook Islands and by some other Commonwealth nations. From 1940 the Sovereign could appoint a person as a Commander, Officer or Member of the Order of the British Empire for gallantry, for acts of bravery (not in the face of the enemy) which ranked below the level required for the George Medal, with the grade being determined by the same criteria as usual and not by the level of gallantry (and with more junior people instead receiving the British Empire Medal). Oddly, this meant that it was awarded for lesser acts of gallantry than the George Medal, but, as an Order, was worn before it and listed before it in post-nominal initials. From 14 January 1958, these awards were designated the Order of the British Empire for Gallantry. Any individual made a member of the Order for gallantry could wear an emblem of two crossed silver oak leaves on the same riband, ribbon or bow as the badge. It could not be awarded posthumously and was effectively replaced in 1974 with the Queen's Gallantry Medal. If recipients of the Order of the British Empire for Gallantry received promotion within the Order, whether for gallantry or otherwise, they continued to wear also the insignia of the lower grade with the oak leaves. However, they only used the post-nominal letters of the higher grade. The collar, also worn by only Knights and Dames Grand Cross, is made of gold. It consists of six medallions depicting the Royal Arms, alternating with six medallions depicting the Royal and Imperial Cypher of George V ("GRI", which stands for "Georgius Rex Imperator"). The medallions are linked with gold cables depicting lions and crowns. The British Empire Medal is made of silver. On the obverse is an image of Britannia surrounded by the motto, with the words "For Meritorious Service" at the bottom; on the reverse is George V's Imperial and Royal Cypher, with the words "Instituted by King George V" at the bottom. The name of the recipient is engraved on the rim. This medal is nicknamed "the Gong", and comes in both a full-sized and miniature versions – the latter for formal white-tie and informal black-tie occasions. Full MBE medal with civil ribbon and the case in which it was presented. Knights Grand Cross and Knights Commander prefix Sir, and Dames Grand Cross and Dames Commander prefix Dame, to their forenames. [b] Wives of Knights may prefix Lady to their surnames, but no equivalent privilege exists for husbands of Knights or spouses of Dames. Such forms are not used by peers and princes, except when the names of the former are written out in their fullest forms. Male clergy of the Church of England or the Church of Scotland do not use the title Sir or Dame as they do not receive the accolade (i.e., they are not dubbed "knight" with a sword), although they do append the post-nominal letters. Appointments to the Order of the British Empire were discontinued in those Commonwealth realms that established a national system of honours and awards such as the Order of Australia, the Order of Canada, and the New Zealand Order of Merit. In many of these systems, the different levels of award and honour reflect the Imperial system which they replaced. Canada, Australia, and New Zealand all have (in increasing level of precedence) Members of, Officers of, and Companions to (rather than Commanders of) their respective orders, with both Australia and New Zealand having Knights and Dames as their highest classes. India, while remaining an active member of the Commonwealth, chose to institute its own set of honours awarded by the President of India who holds a position roughly similar to that of the monarch in Britain. These are commonly referred to as the "Padma Awards" and consist of Padma Vibhushan, Padma Bhushan and Padma Shri in descending order. These do not carry any decoration or insignia that can be worn on the person and are not allowed to be used as titles along with invididuals' names. The Order has attracted some criticism for its naming having connection with the idea of the now-extinct British Empire. Benjamin Zephaniah, a British Jamaican poet, publicly rejected an OBE in 2003 because, he asserted, it reminded him of "thousands of years of brutality". He also said that "It reminds me of how my foremothers were raped and my forefathers brutalised." In 2004, a House of Commons Select Committee recommended changing the name of the award to the Order of British Excellence and changing the rank of Commander to Companion, as the former was said to have a "militaristic ring". The members of The Beatles were made MBEs in 1965. John Lennon justified the comparative merits of his investiture by comparing military membership in the Order: "Lots of people who complained about us receiving the MBE [status] received theirs for heroism in the war – for killing people… We received ours for entertaining other people. I'd say we deserve ours more." Lennon later returned his MBE insignia on 25 November 1969 as part of his ongoing peace protests. Other criticism centres on the claim that many recipients of the Order are being rewarded with honours for simply doing their jobs; critics claim that the civil service and judiciary receive far more orders and honours than leaders of other professions. ^ It is common, but incorrect, to omit "of the Most Excellent Order" and other important words not implied by the initials. 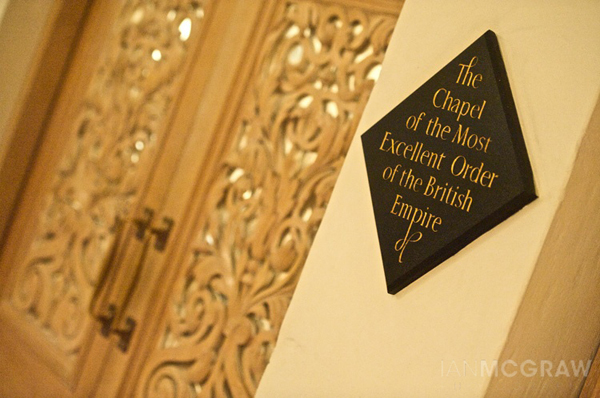 ^ a b c "Order of the British Empire". The Official Website of the British Monarchy. The Royal Household. Retrieved 24 August 2009. ^ The London Gazette: (Supplement) no. 30250. pp. 8791–8999. 24 August 1917. ^ The London Gazette: (Supplement) no. 57855. p. 26. 31 December 2005. ^ "Radio's Wogan becomes Sir Terry". BBC World News. BBC World News. 6 December 2005. Retrieved 7 February 2009. ^ The London Gazette: no. 31084. p. 15135. 27 December 1918. ^ "Birthday Honours: 'Working class' British Empire Medal revived". BBC News. Retrieved 20 June 2012. ^ The London Gazette: (Supplement) no. 41285. p. 365. 14 January 1958. ^ The London Gazette: (Supplement) no. 56878. p. 3353. 17 March 2003. ^ "Emblem for honours (Archived 4 April 2012)". The National Archives. Directgov (UK). Retrieved 26 July 2014. ^ "Chronology of the Life of C.S. Lewis". ^ C.S., Lewis (1994). W. H. Lewis, Walter Hooper, ed. Letters of C.S. Lewis. New York: Mariner Books. p. 528. ISBN 0-15-650871-0. ^ Brian Roylance; George Harrison; John Lennon; Paul McCartney; Ringo Starr (2000). The Beatles Anthology. Chronicle Books. p. 183. ISBN 0-8118-2684-8. 40x40px Wikimedia Commons has media related to Order of the British Empire. </td></tr></table></td></tr></table> Lua error in Module:Authority_control at line 346: attempt to index field 'wikibase' (a nil value).